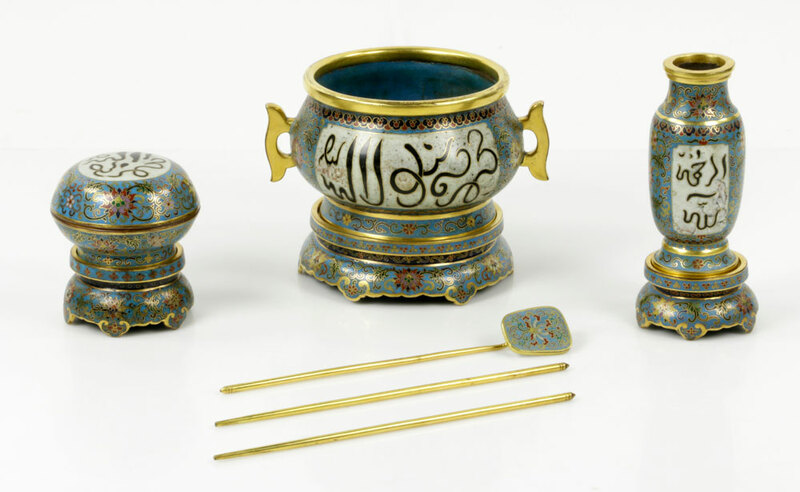 Kaminski Auctions Asian specialist has brought a selection of new to the market pieces including an exciting selection of Sino- Tibetan bronzes from private collections all over New England. Kaminski Auctions announces it’s summer Asian Antiques and Estate Auction to be held Sunday, June 11, 2017. The two-session sale commences with Asian Art and Antiques in Session One starting at 10:00 am EST followed by the Estate portion of the sale in Session Two. Kaminski Auctions Asian specialist has brought a selection of new to the market pieces including an exciting selection of Sino-Tibetan bronzes from private collections all over New England. Four in particular highlighted in the sale include lot numbers #6038 through #6041. 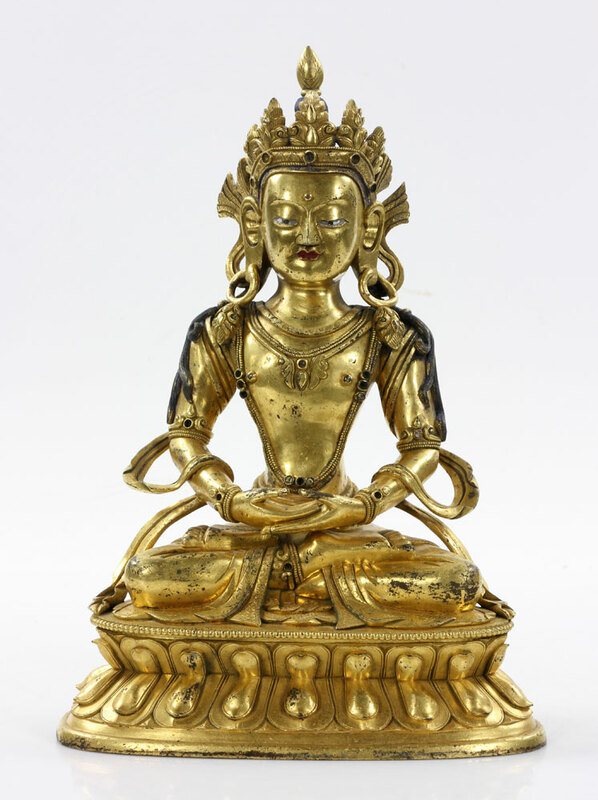 Beginning with a rare 15th-16th century Sino-Tibetan bronze Tara figure of the Mid- Ming dynasty, seated in the Lalitasana position on a double lotus base. The right hand in the Varada mudra and the left hand raised in Vitarka mudra. With both hands holding the stem of a lotus blossom at the shoulders. From a Connecticut collection this exquisite piece measures 6 ¼ inches in height and is estimated at $6,000-$8,000. Two additional Sino-Tibetan bronzes harking from a New York private collection include Lama figures wearing exquisitely incised robes, sitting with legs crossed on a lotus stands atop three tiered pedestals with Sanskrit script writings. They both measure 7 ½ inches in height and are valued at $6,000-$8,000 and $4,000-$6,000 respectively. 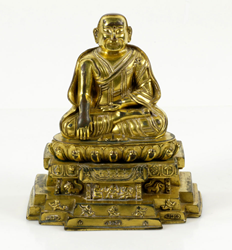 The fourth gilt bronze measures 10 ½ inches high and is a Sino-Tibetan Buddha sitting with legs crossed on a lotus stand. It is from a Mountainside, New Jersey collection and is estimated to bring $6,000-$8,000. From the same collection comes one of the top lots of the sale; a rare Qing Dynasty Chinese cloisonné censer set, consisting of the censer with stand, a box with stand and a vase with stand, all with Qing dynasty marks on the bases. This rare set is estimated to bring $8,000-$12,000. An additional bronze piece of interest is a Japanese Meiji period bronze covered urn valued at $5,000-$8,000. 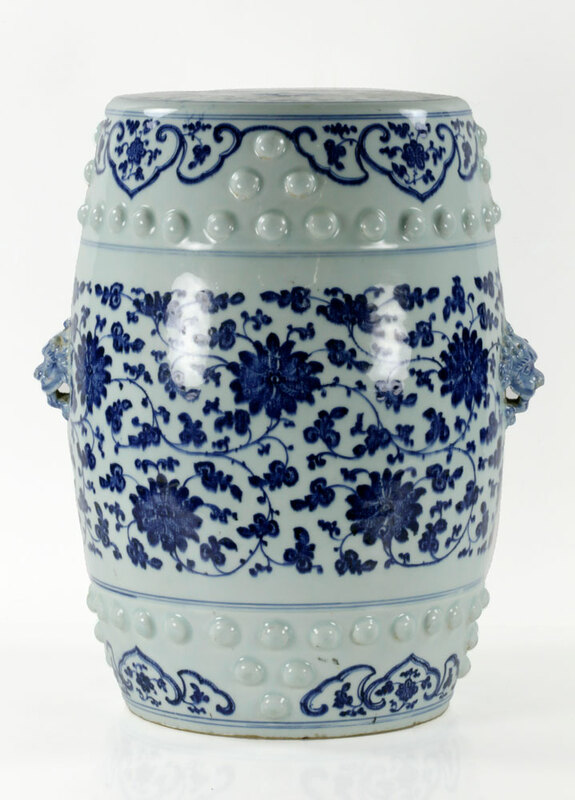 Chinese porcelain highlights include a 18th/19th century Chinese blue and white porcelain garden stool measuring 17 ½ inches high estimated at $6,000-$8,000. 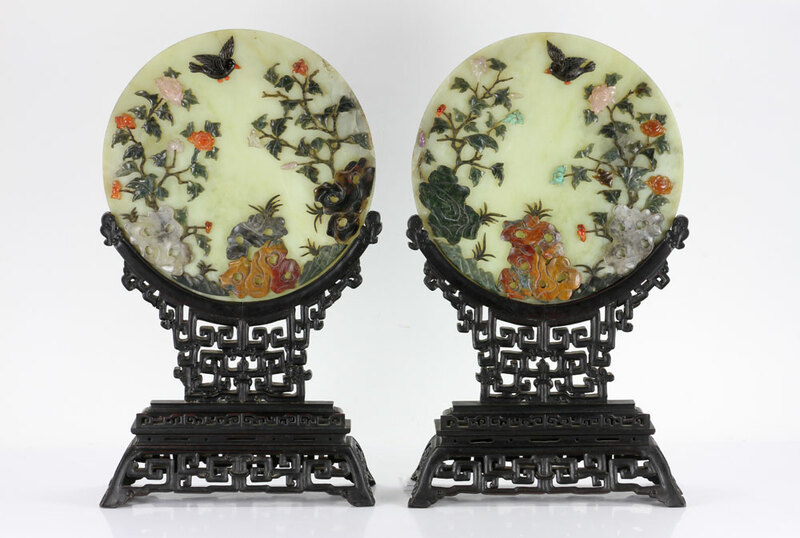 There is also a wonderful pair of Chinese jade table screens mounted with carved agate, shoushan stone, green jade, and crystal pink quartz. On their original carved hardwood stands they measure 21 1/2 inches high by 12 inches wide and are estimated to bring $3,000-$5,000. A Chinese Song/Yuan dynasty celadon charger on it’s original wood stand and a Chinese jun glazed water pot, with original hardwood stand round out the porcelain highlights of this sale. The estate portion of the auction starts out with a fine collection of American and foreign coins. A highlighted lot includes America gold coin quarter eagles ($2.50), to include: 1852, 1843 ‘O”, 1878, and 1900 Liberty heads, along with a 1912 Indian Head Groveland weighing 21 grams troy weight. The lot is estimated to bring $1100-$1700. There is also a Pablo Picasso ceramic pitcher titled "Chouette Femme" (Woman Owl). 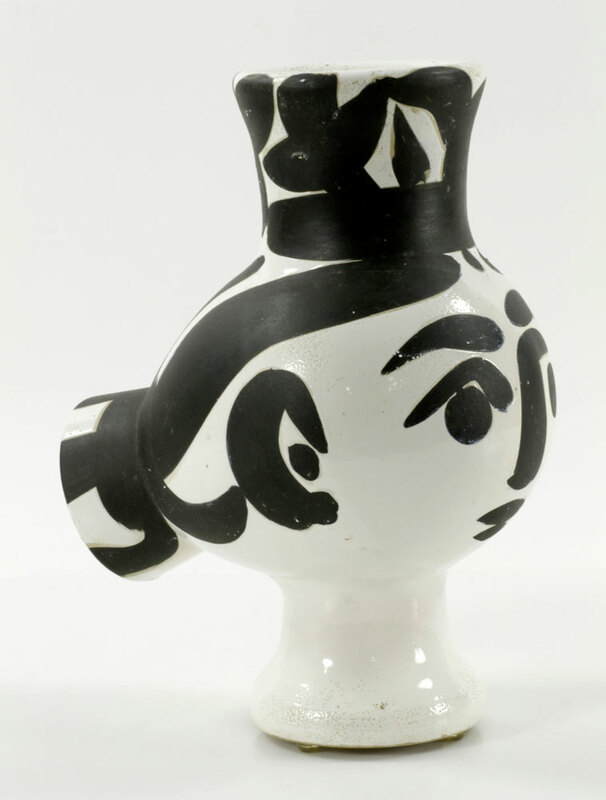 Glazed, painted, signed and embossed "Madoura"; it is from a Picasso edition circa 1951. It was originally purchased from Gordon's Print Price Annual in Naples, Florida in 1993. It is referenced in the Catalogue of the Edited Ceramic Works 1947-1971 by Alain Ramie, #119 and is valued at $10,000-$15,000. A particularly interesting piece given that the skull symbol is so in vogue, is a carved Italian marble skull mask measuring fifteen inches in height from an important Italian collector. Fine art features two paintings by the English artist Francis M. Trappes (English, fl.1868 - 1885), both oil on canvas. One is titled “Rabbit Shooting, and is signed and monogrammed 1876, the second is a farm scene, oil on canvas, signed and monogrammed 1873, both are from a Boca Raton estate. There is also a Henry Spencer Moore (English, 1898-1986) lithograph of sisters with child signed lower left, edition 43 of 50 originally purchased at Eckert Fine Art, Naples, Florida in 2001. It comes with the original receipt of purchase. Preview for the auction will be held at the Kaminski Auction gallery at 117 Elliott Street, Rte. 62, Beverly, Massachusetts, Thursday- Saturday, June 8-10 from 10:00 am – 5:00pm and day of sale starting at 8:00am. Preview is open all day while auction is live. For more information go to http://www.kaminskiauctions.com and sign up to bid with KaminskiLIVE.